The US Conference of Mayors holds an annual meeting to guide federal policy decisions that affect people living in the nation's cities. Mayors know firsthand the effects of sequestration and other budget cuts to essential services and programs that result from obscenely high levels of military spending. If you count all the nuclear programs funded under the Dept. 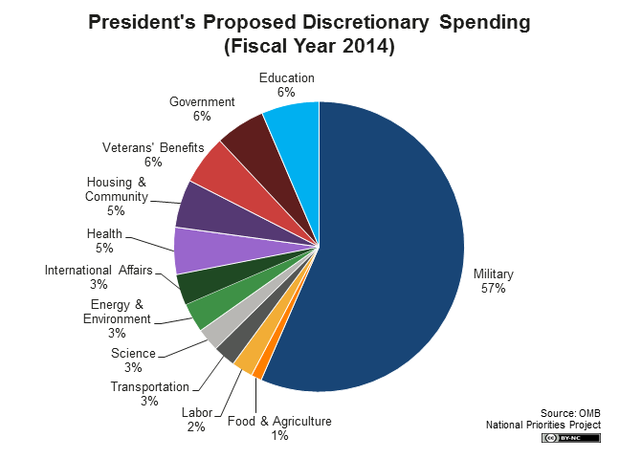 of Energy rather than through the Pentagon, the share of federal discretionary spending on military is even higher than 57%. If only Congress and the Obama administration listened to constituents instead of campaign contributors. Here is the text of the great Mayors for Peace resolution that was unanimously adopted at the conference (PDF). “It is unlikely that any state or international body could address the immediate humanitarian emergency caused by a nuclear weapon detonation in an adequate manner and provide sufficient assistance to those affected. The historical experience from the use and testing of nuclear weapons has demonstrated their devastating immediate and long-term effects. While political circumstances have changed, the destructive potential of nuclear weapons remains. Resolution No. 56, Submitted by: The Honorable Donald L. Plusquellic, Mayor of Akron (OH); The Honorable Ed Pawlowski, Mayor of Allentown (PA); The Honorable John Hieftje, Mayor of Ann Arbor (MI); The Honorable Tom Bates, Mayor of Berkeley (CA); The Honorable Matthew T. Ryan, Mayor of Binghamton (NY); The Honorable Henrietta Davis, Mayor of Cambridge (MA); The Honorable Mark Kleinschmidt, Mayor of Chapel Hill (NC); The Honorable Satyendra Singh Huja, Mayor of Charlottesville (VA); The Honorable Franklin T. Cownie, Mayor of Des Moines (IA); The Honorable Michael A. Tautznik, Mayor of Easthampton (MA); The Honorable Kitty Piercy, Mayor of Eugene (OR); The Honorable Ed Malloy, Mayor of Fairfield (IA); The Honorable Joy Cooper, Mayor of Hallandale Beach (FL); The Honorable Alex Morse, Mayor of Holyoke (MA); The Honorable Mark Stodola, Mayor of Little Rock, (AR); The Honorable Paul Soglin, Mayor of Madison (WI); The Honorable John Stefano, Mayor of New Haven (CT); The Honorable David J. Narkewicz, Mayor of Northampton, MA; The Honorable Chris Koos, Mayor of Normal (IL); The Honorable Frank Ortis, Mayor of Pembroke Pines (FL); The Honorable Michael Brennan, Mayor of Portland (ME); The Honorable Gayle McLaughlin, Mayor of Richmond (CA); The Honorable Ardell Brede, Mayor of Rochester (MN); The Honorable Stephen Cassidy, Mayor of San Leandro (CA); The Honorable Helene Schneider, Mayor of Santa Barbara (CA); The Honorable Bruce R Williams, Mayor, Takoma Park (MD); The Honorable Neal King, Mayor of Taos Ski Valley (NM); The Honorable Richard D. Schneider, Mayor of South Pasadena (CA); The Honorable Laurel Lunt Prussing, Mayor of Urbana (IL); The Honorable Geraldine Muoio, Mayor of West Palm Beach (FL).